Buy 1 for $17.12Buy 2 / Save $0.91!Buy 3 / Save $3.42! Size (inches): 1.93" X 1.93" X 3.86"
Stockpiling Creatine shortens the time necessary for the body to generate replacement Creatine Phosphate thus significantly supporting muscle recovery time between short duration, high intensity activities. Inactive or dystrophic muscle (such as occurs as a result of injury) has by nature low levels of Creatine. Supplementation with Creatine permits muscle to work harder during therapy and, thus, rebuild itself to its normal state. 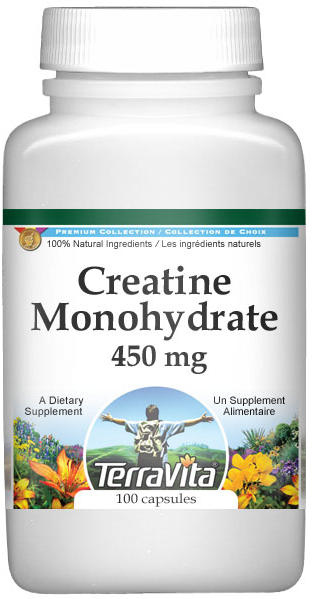 * Correct Creatine DeficienciesDisease or age related Creatine deficiencies in the brain and skeletal muscle can be improved by the oral administration of Creatine Monohydrate helping to restore a more active, normal lifestyle. It is our belief that Creatine supplementation has broad application as a dietary supplement. Specially, it could be used to prolong peak performance in athletes, aid in the recovery from injury by helping to rebuild muscle weakened from extended periods of inactivity, and provide more energy to older, less active individuals. Keep away from children. Always consult a physician before starting an excercise program.